Riverside hotel with a wonderful skyline view and a short ferry ride into New York City. 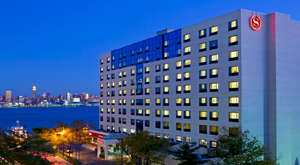 Beautiful waterfront hotel with easy train or ferry access to New York City. Great location for sports fans headed to the Meadowlands Stadium or visitors looking for excitement in Manhattan. An iconic landmark on the waterfront where magnificent Manhattan unfolds before your eyes. Only sixteen miles from downtown Manhattan, Newark, New Jersey is the financial, commercial, and transportation hub of the Garden State of New Jersey. From festivals and parades to museums and musical venues, there is something for everyone to explore and enjoy in Newark, New Jersey. Book your vacation package today and save because bags fly free®† with Southwest Vacations®.